Exploring current social, political, and economic challenges in the U.S.
"This initiative is something that is right at the heart of what MIT stands for. We believe in solving important problems, contributing collectively wherever we can." 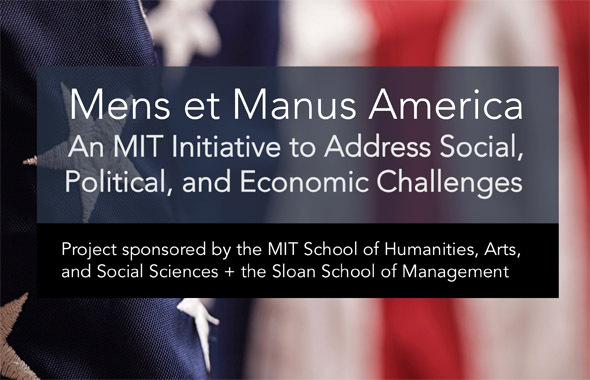 This non-partisan MIT initiative convenes research-informed lectures and discussions to explore major, long-term social, political, and economic issues in the U.S. We are asking: What can MIT do to help address these challenges and bolster the health of our democracy? How can we use research to inform our decisions about engagement, both as citizens and as leaders of organizations? Join us as we frame the issues and generate ideas for making a positive impact. James and Deborah Fallows traveled to dozens of towns and small cities across America – places like Duluth, Minnesota and Demopolis, Alabama – and from their interviews and experiences crafted their best-selling book Our Towns: A 100,000-Mile Journey into the Heart of America. In a conversation with Barbara Dyer, Senior Lecturer at MIT Sloan and Executive Director of the Good Companies, Good Jobs Initiative at MIT Sloan, the Fallowses will discuss what they’ve learned about the surprising reinvention going on in many American communities. The discussion will be followed by questions from the audience. After the event, there will be a book signing in the Ting Foyer outside the auditorium. How Does Gender Matter in Politics? Excerpts from the play "Her Opponent," featured a male "Clinton" and a female "Trump," followed by discussion with creators Maria Guadalupe and Joe Salvatore. Sinan Aral, the David Austin Professor of Management at MIT, will give a presentation on the science and implications of fake news for our democracy, politics, and country. Followed by a student-led discussion. The deadline for extending DACA looms amid larger debates about US immigration policy. How can the US achieve a fair, humane policy for accepting and integrating immigrants? 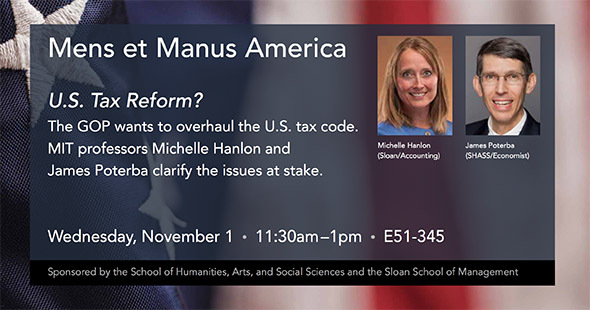 Join us as Mary Waters of Harvard and Doug Massey of Princeton provide the necessary context for understanding the issues. Rural America is often stereotyped as a set of regions left hopeless by economic forces beyond their control. This month, an MIT audience was asked to suspend such stereotypes and listen as four community development leaders painted a more nuanced portrait of America’s rural areas. "There’s an enormous amount of innovation across this country and a lot of strength," said Barbara Dyer, Senior Lecturer and Executive Director, Good Companies, Good jobs Initiative, at the MIT Sloan of Management. "To the members of the MIT community: The tax legislation now pending in Congress contains several provisions that could have damaging impact on members of our community and the Institute as a whole. Because the situation is complex and fluid, I write to offer our current assessment of which provisions concern us the most and why, and to let you know that MIT is actively following developments in DC and striving to achieve a better outcome. 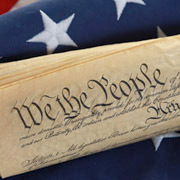 If you share our concern, you can express your views to Congressional leaders." Various concerns about the security of U.S. elections have arisen over the past two decades, some more significant that others. While many studies have shown that voter fraud, for instance, is vanishingly rare in the U.S., what about the state of electoral administration, lost votes, and cyber attacks? On Oct. 16, two experts teamed up at MIT to share insights from their research on what is and isn't working in America's electoral system. "The number of votes lost during collection and counting has been cut in half since 2000. 'A lot of good things have happened," Stewart said — including better voting machines, modernized registration systems, and an increase in the professionalization of election administration." Think of the last time you tried to talk to someone about social, environment, or political issues where you didn't already agree. How well did it go? These conversations are critical for our families, organizations, and democracy, but too often get stuck. MIT Sloan Senior Lecturer Jason Jay will hold an interactive workshop based on his new book Breaking Through Gridlock, giving personalized guidance on how to get unstuck. Join us if you are ready to go beyond "preaching to the choir" and lead change across the lines. Can We Solve the Politics of Misinformation? Why do voters believe lies and questionable political claims? In the wake of recent elections, both in the US and abroad, many observers have questioned why voters place their trust in candidates who disregard the facts and the truth. Berinsky’s recent research provides striking evidence that voters on either side of a partisan divide are apt to interpret their candidate’s false statements as true. Zuckerman’s recent research demonstrates that when voters feel that the political process is unjust, they appreciate lying demagoguery as symbolic protest. Hochschild, Professor Emerita of Sociology at the University of California, Berkeley, discussed her new book, Strangers in Their Own Land: Anger and Mourning on the American Right. The talk was followed by discussion and a book signing. One of the most influential sociologists of her generation, Hochschild is the author of nine books, including The Second Shift, The Time Bind, The Managed Heart, and The Outsourced Self. Beyond the events, you can become engaged as a member of the Mens et Manus America planning committee. Sponsored by the School of Humanities, Arts, and Social Sciences (MIT SHASS) and the Sloan School of Management (Sloan), the initiative is led by Ezra Zuckerman Sivan, Deputy Dean of Sloan, and Agustín Rayo, Associate Dean, School of Humanities, Arts, and Social Sciences, with participation by many MIT students and members of the Sloan and MIT SHASS faculties and staff. Report from the Brennan Center at NYU about "vote fraud"
"It is important to protect the integrity of our elections. But we must be careful not to undermine free and fair access to the ballot in the name of preventing voter fraud... [E]xamination after examination of voter fraud claims reveal fraud is very rare, voter impersonation is nearly non-existent, and much of the problems associated with alleged fraud relates to unintentional mistakes by voters or election administrators."